Project engineer Shelley Rea demonstrates the X1, a newly developed wearable robotic suit with applications in space and on Earth. It's a superhero suit for Earth and outer space. NASA and other research groups have made a wearable robotic suit, called X1, to live a double life of usefulness. Up in space, the suit would act as an exercise machine for astronauts, providing extra leg resistance for space travelers. On Earth, the suit can be tuned to lighter settings and support paralyzed people in standing and walking. "It's the exact same suit," said Nic Radford, the former project manager for NASA's so-called exoskeleton research who now leads NASA's research into humanoid robots. The X1 is an example of the myriad uses that are coming out of NASA's Robonaut project, which sent a robot helper to the International Space Station last year, he said. The X1, which incorporates many Robonaut technologies, straps onto wearers' shoulders with a harness and supports wearers' legs with separate shells. The shells have 10 joints, including four motorized joints for the hips and knees and six nonmotorized joints that allow wearers to step side to side, turn and flex their feet. The X1 will be especially helpful to future missions to Mars or other planets, Radford said. On such long journeys, it will be important for human explorers to exercise two to three hours a day to fight against the bone and muscle loss that happens in low gravity. But manned spacecraft to Mars wouldn't be able to tote around the exercise equipment that International Space Station crew members use, for instance. International Space Station astronauts exercise on "a ton of hardware," Radford told TechNewsDaily. "Literally 2,000 pounds of hardware. Well, something like that is not really going to be useful to a mission to Mars, where you have a small capsule." The X1, on the other hand, weighs 57 pounds. Radford and his team are now starting negotiations to send the X1 to the International Space Station for testing. Such negotiations usually take about two years, Radford said. Back on Earth, NASA is working with the Florida Institute for Human and Machine Cognition to study the X1 for people who have paraplegia as a result of accidents, strokes or other conditions, and cannot walk. The X1 is an especially safe device, Radford said, because it's based on technology developed for the Robonaut 2, the International Space Station helper. "If you're going to put a humanoid robot inside the space station, you don't want it poking its hand out and causing an accident," he said. The Florida Institute for Human and Machine Cognition is now testing the X1 in a small number of people with paraplegia, Radford said. Researchers are gathering people's feedback on the comfort of the X1. Supportive exoskeletons like NASA's can feel uncomfortable because they put pressure on people's legs in order to generate the force they need to work, Radford explained. "I dream of the day when I can get people out of wheelchairs," Radford said. "I can relate on a very small level," he added. He recently had to have his ankle replaced and still walks with a limp. "It's been a difficult journey," he said. In the future, NASA wants to develop X1 to help astronauts walk on the surface of planets. 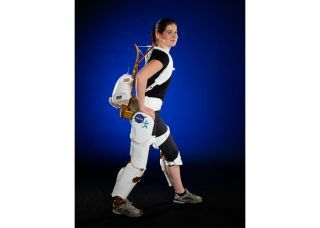 Space explorers could wear the exoskeleton along with a spacesuit. The exoskeleton would give wearers extra strength, much like the comic-book superhero Iron Man's suit does, and help wearers move more easily in low-gravity environments. Researchers also want to make the suit balance on its own for people with paraplegia. Right now, paraplegic wearers must use arm crutches. "What you really want to do is have the exo device balance itself, so the patient has use of his hands," Radford said. That research will happen in NASA's humanoid research lab, he added, where the agency is studying how to give robots bipedal motion. This story was provided by TechNewsDaily, a sister site to SPACE.com. You can follow TechNewsDaily staff writer Francie Diep on Twitter @franciediep. Follow TechNewsDaily on Twitter @News_Innovation, or on Facebook.